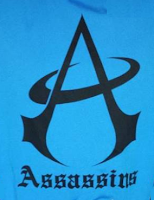 Ambiguous Grey - Washington DC's elite mixed ultimate team - has an updated logo. The new logo barely has any resemblance to their old identities. 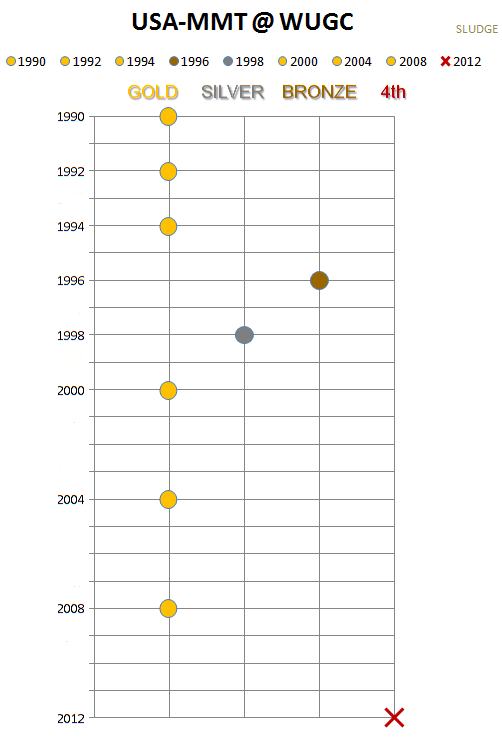 At the bottom, the familiar 'A-G' in the row of 3 stars is saved from the D.C. flag motif, minus the 2 horizontal bars. The red, white and blue United States Military star and stripes aircraft crest is replaced with a blue-ish purple-y stone-faced bear atop stripes related to the military rank of a Petty Officer, second class. The 2 D.C. flag "bars" may have been repurposed as a bent perch for the the bear mount. Unintentionally, the bear's face leaves the negative space for the letters D and C.
I am blanking on any DC references for bears. Panda bears? Yes. Beards? Yep. Bears? nope. Perhaps the bear is AG's spirit animal. For what it's worth, an anagram of their team name is: "Yogi bear mug us." Just in time before the team starts defending their Pro Flight status in the Triple Crown Tour's mixed division. 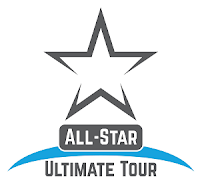 After a successful inaugural year in 2015, the All-Star Ultimate Tour is regrouping to, again, travel from the West Coast to the East Coast with a team of college women ultimate players to compete against women's club teams. The project seeks $12,000 for the 9-city tour. According to the project's donation page: "This year, we are tackling our media strategy on our own. Most of the All-Star Ultimate Tour is self-sustained through ticket sales and sponsorships but unfortunately, that is not enough. We need the community's help to put on this great show and deliver top quality media of female athletes. This year we will again produce high-quality game footage in post-production, free and available to everyone all over the world. Our media plan will include game footage with slow-motion replays and full commentating as well as recap videos, interviews, and behind-the-scenes insights. Help us produce permanent media of some of the world's best flatballin' athletes!" 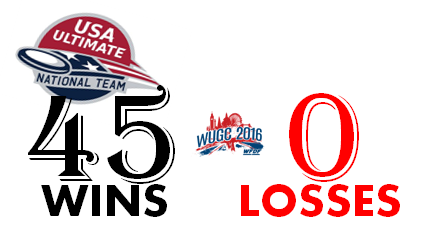 Congratulations to all U.S. National ultimate Team players, coaches and staff involved with winning a combined 5 gold medals at WFDF's 2016 World Ultimate (and Guts) Championships in London. With stellar performances and results, you are deserving of a parade! Consider this your virtual ticker tape parade with color-coded* shreds. . . The WFDF 2016 World Ultimate (and Guts) Championships in London are now complete. Five USA Ultimate National Teams teams competed in each division, and all teams won the gold medal adding to the USA's medal total. The ultimate National Teams representing the United States went undefeated at the international tournament with 45 wins. 45 wins and no losses! Similar to past years when the U.K. hosted WUGC events, the USA teams swept in all* divisions. Collectively, the U.S. teams outscored opponents 675 to 264; that's a +411 goal differential. Congratulations to all the USA teams and players that medaled! WFDF's World Ultimate (and Guts) Championships were a sweeping success for the five USA Ultimate National teams. 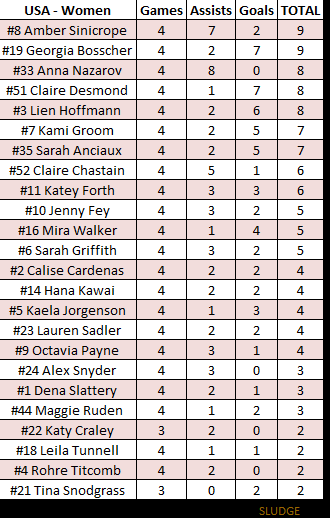 Using the provided WUGC data, here is a compilation of the offensive leaders for all the USA Ultimate teams. 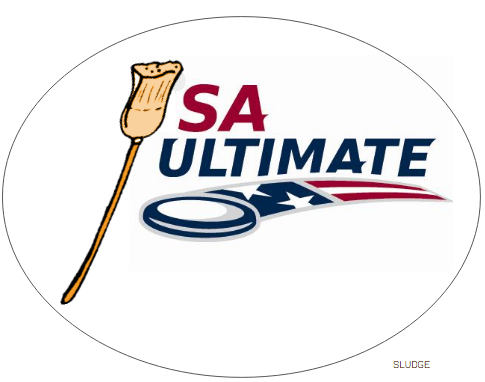 After USA's clean sweep at WFDF's 2016 World Ultimate and Guts Championships in London, the governing body for the sport of American ultimate updated their logo. Apparently, any Joe Josh can make a venn diagram. 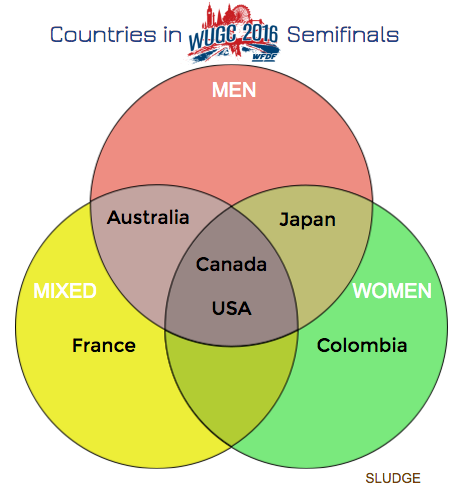 So, continuing the World Ultimate (& Guts) Championships' venn diagrams (playoffs, semis), here's an expanded update showing all WUGC ultimate divisions. Five different countries advanced to the WUGC finals. Team USA competes/ed for gold in all of the ultimate divisions. Good luck/congrats to all teams. The semifinals are over and the ultimate competition is nearing the end at WFDF's World Ultimate (& Guts) Championships. out of 5 divisions, 3 of the #1-seeds advanced to their division finals. Overall in the five WUGC ultimate finals, there are (3) 1-seeds, (3) 2-seeds, (0) 3-seeds, (3) 4-seeds, and (1) 5-seed. 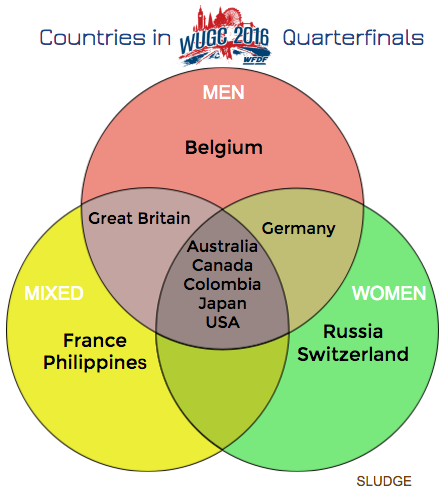 As a follow-up to the quarterfinals visual...here are the six different countries that advanced to the WUGC semifinals in the Men, Mixed and Women divisions. Men's ultimate players representing Team USA at World Ultimate and Guts Championships have been sporting hairy upper lips. 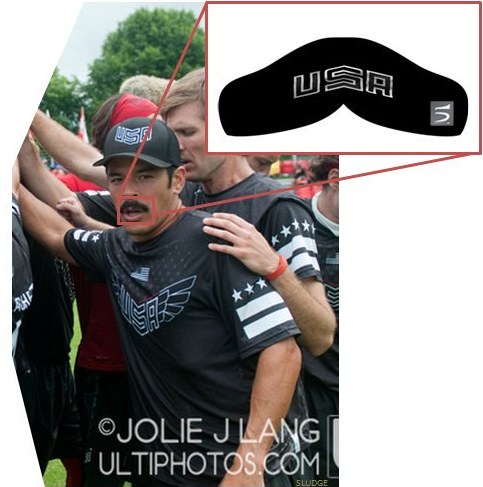 Here's photographic evidence of Tom Doi's mustache as being outfitted by Five Ultimate. TBT: U.S. 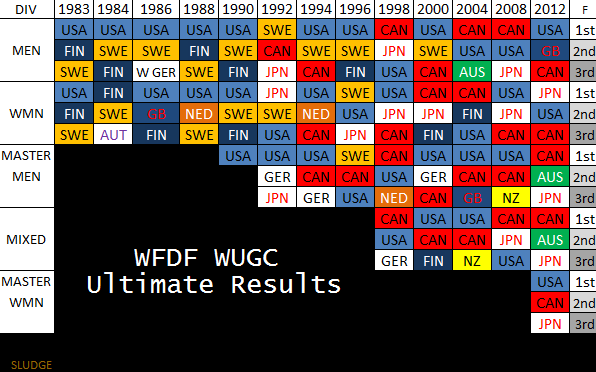 Teams at Past WUGC in U.K.
WFDF's World Ultimate and Guts Championships have been hosted in the United Kingdom twice before - 1986 and 1994 - in Colchester . This year's WUGC is currently hosted in London. 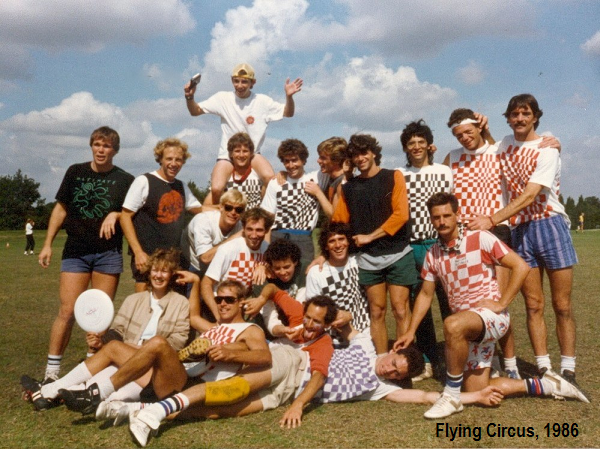 At the 1986 WUGC, USA won gold in the Men's and Women's divisions with Flying Circus (M) and Lady Condors (W). Both teams went undefeated and finished with a (15-0) record. 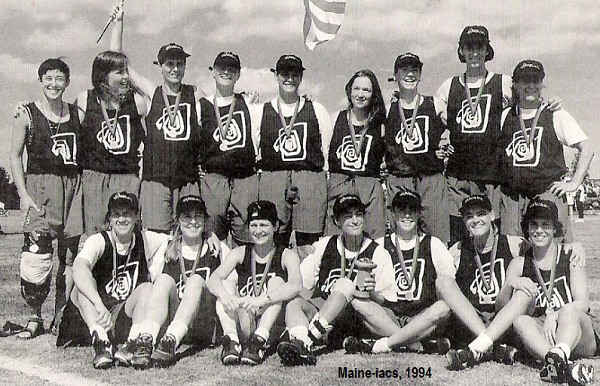 Then at the 1994 WUGC, USA won gold again in Men's and Women's division, plus another gold in the Men's Masters division — their 3rd gold in a row. New York Ultimate (M) won the final over Sweden by the score of 22-20. The USA Masters team had a player named "Nob" Rauch on the roster won all 8 games and beat Canada in the finals. Maine-iacs (W) won all 10 games en route to gold, with an astounding average goal differential of 15.6 (games were played to 19). 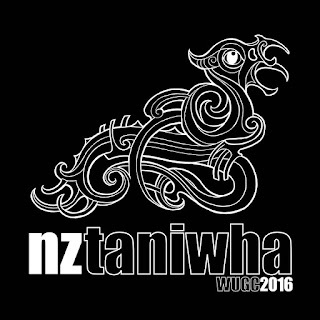 Twelve different countries have advanced to the quarterfinals of the Men's, Mixed and Women's division at WFDF's 2016 World Ultimate (& Guts) Championships. Australia, Canada, Colombia, Japan and USA advanced to the quarterfinals in all 3 divisions. NOTE: Chart fail. Darn the lack of shared data between Mixed + Women Divisions. 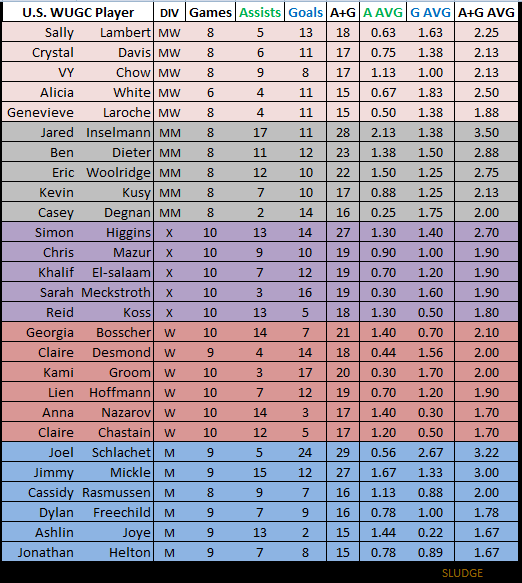 The United States ultimate teams at WFDF's World Ultimate (& Guts) Championships have done incredibly well. 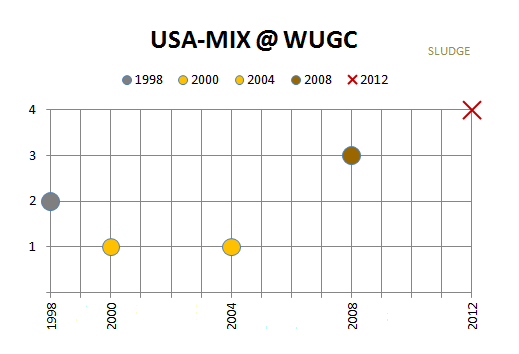 Since 1983, USA has collectively won an impressive 25 gold medals, plus 6 silver and 5 bronze at WUGC. The USA Masters teams are off to be a great start at WUGC! The Women's Masters team, BKFT, has 4 wins against France (15 to 0), New Zealand (15 to 11), Germany (15 to 7) and Japan (15 to 4). The Men's Masters team, Boneyard, has also posted 4 wins versus France (15 to 7), Finland (15 to 7), Denmark (15 to 12) and Switzerland (15 to 7). Crystal Davis (4 A, 6 G) and Genevieve Laroche (2 A, 8 G)are co-leaders at 10. Jared Inselmann leads with 7 assists and 5 goals in 4 games. There are 8 international Guts teams competing at WFDF's World (Ultimate and) Guts Championship(s). Germany and the United States each have 2 teams and Australia, Belgium, Great Britain and Japan each have one team. The flying disc (or technically flying Frisbee) game of Guts is said to be "an easy game to play; a hard game to win." Games are played to 21 points and calls are made by players on the field. Guts teams stand 15 yards apart with game action described as: "You've got 30 seconds of terror followed by a minute or two of relaxation while one of your guys throws, followed by another adrenaline rush." The 2015 North American Guts Frisbee Champions The Appleton (Wisconsin) Assassins represent the USA. Mike Colden, Fox Cities Guts Frisbee Club president and tournament director, boasts "[The Appleton Assassins] got so much speed, velocity and youth on the disc that it's almost impossible not to win." RELATED: One famous person opined Guts was a 'not-so smart' name. 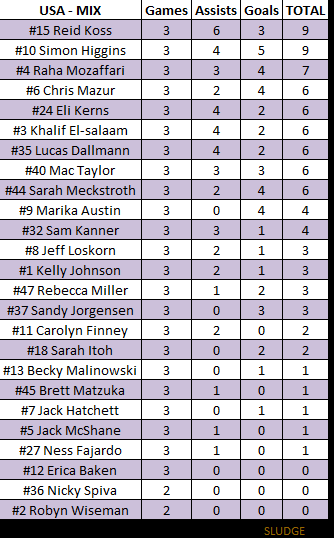 The U.S. National Teams in the Men's (2-0), Mixed (3-0) and Women's (4-0) ultimate divisions are unbeaten at 2016 World Ultimate [& Guts] Championships. Jimmy Mickle at the top of the Men's leader board with 4 goals and 3 assists. Reid Koss (6 A, 3 G) and Simon Higgins (4 A, 5 G) share the top spot on the mixed squad. Thanks for tossing with me. 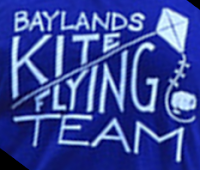 Over $85,000 was collected by the World Flying Disc Federation in the springtime. In addition to the week-long international ultimate tournament in London, WFDF is also undertaking the community-funded video project of broadcasting games. Of the 1,183 donations, London was the top city with 78 backers followed by Sydney (28) and Seattle (28). 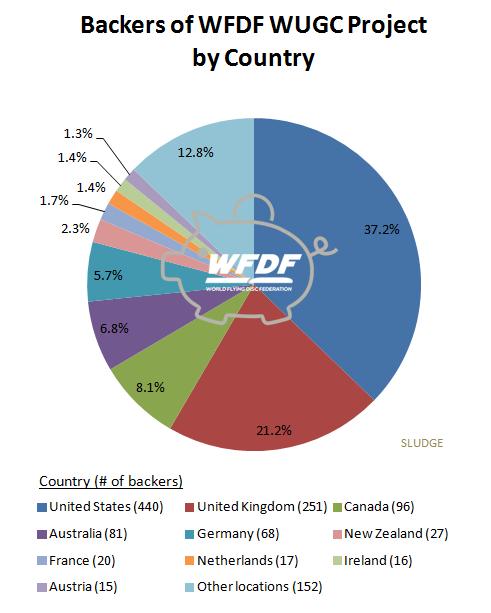 Other notable cities with a large concentration of backers was Washington, D.C. (21), Vancouver (20) New York (20), Melbourne (18), Auckland (16), Toronto (15), and Los Angeles (14). A calculator says that the average donation amount = $72.00. 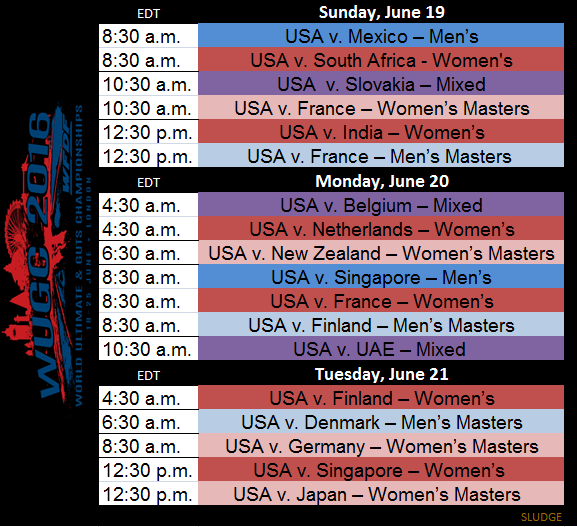 View the stream schedule of WUGC ultimate games. The next World Ultimate (and Guts) Championships begin in a few days! 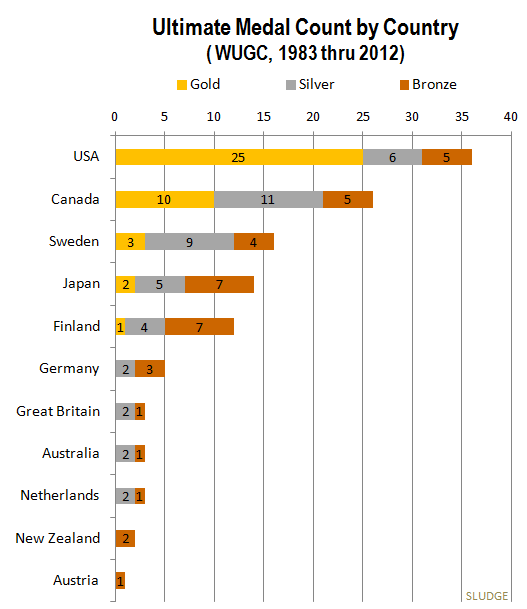 Expanding beyond participating countries, here's a history of countries that have ever medaled (1st, 2nd or 3rd places) at a WUGC event. Canada (26) and the United States (36) have collectively won more WUGC medals (62) than all other countries combined (59). NOTES: Data scraped from WFDF event pages. West Germany's 1986 bronze medal is attributed to Germany. 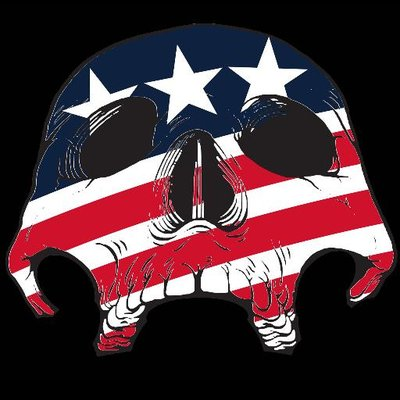 Boneyard is representing the United States at the 2016 World Ultimate (and Guts) Championships in the Masters Men's Division. The North Carolina-based team earned this honor by winning the 2015 USA Ultimate Masters Men's Championship. Boneyard also won the World Club Championship title in 2014. 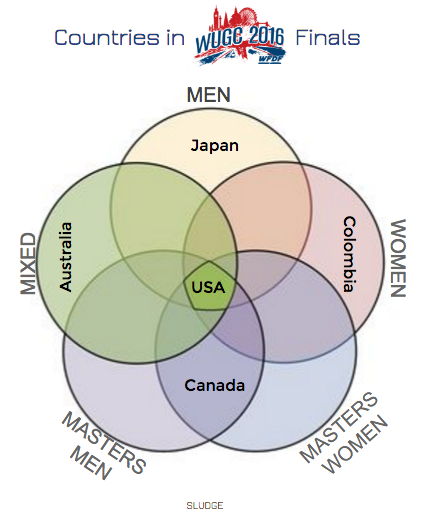 In a division with 16 other teams, the USA Masters Men's team is seeded 4th at 2016 Worlds. 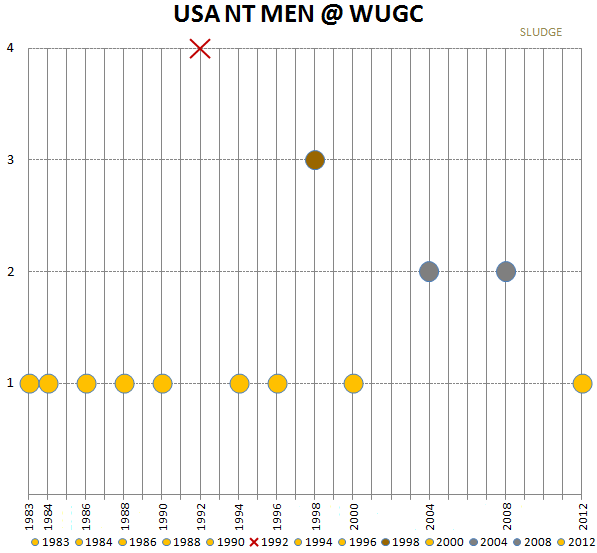 USA has won the Masters Men WUGC title six times in 9 tournaments; 3 titles in the last 4 events. The USA Masters Men's team finished 4th at 2012 WUGC; USA's lowest finish ever in this division. Team USA begins their run to rebound and claim another World title on Sunday, June 19, at 12:30pm EDT against France. Victor Mather attempts to capture all sides of the referee issue in his article The Ultimate Debate: To Referee or Not to Referee [06.16.2016]. USA Ultimate and WFDF on one side versus Major League Ultimate and American Ultimate Disc League on the other. The non-profit organizations like self-refereeing, and claims the International Olympic Committee (IOC) likes it, too. That said...observers are used in most USAU championship games; Game Advisors will be present at WFDF's upcoming international event. On the other side, the for-profit (semi)pro ultimate leagues prefer referees to ref and players to play for a better fan experience. This has been an ongoing debate for a long time. Read what Bill Nye had to say in 1980 about refs in the sport of ultimate. 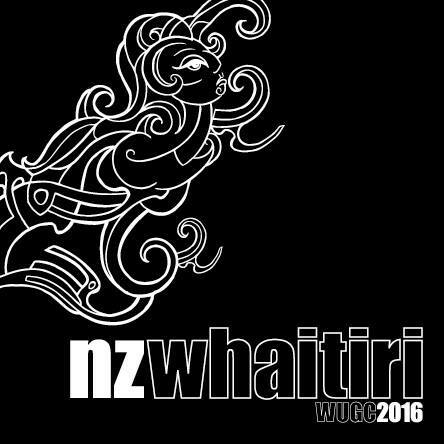 Learn the Kiwi names for each of the national ultimate squads from New Zealand. Plus, have a squiz at these quality logos for each team. 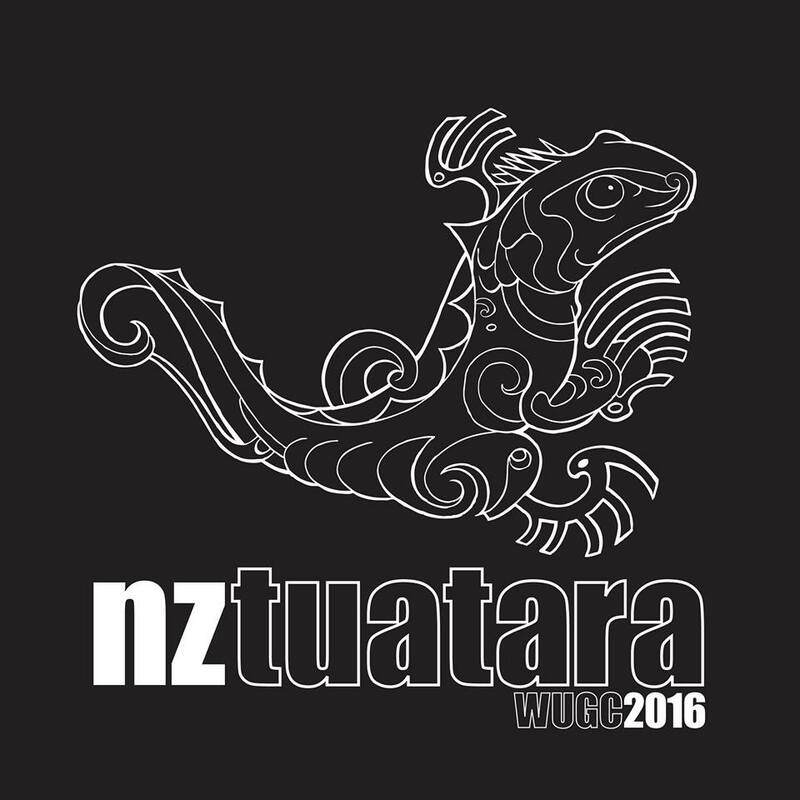 Men: Taniwha, a mythical beast of defense. 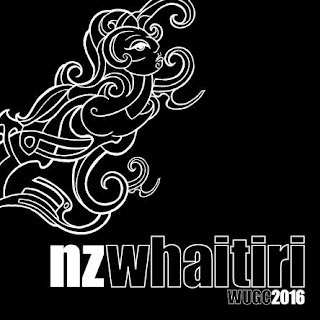 Women: Whaitiri, female personification of thunder. 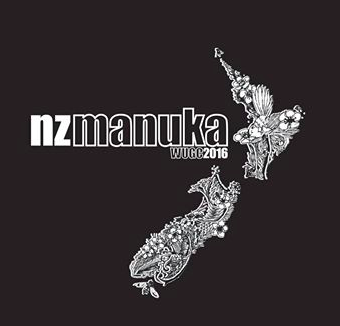 Mixed: Mānuka, a tree valued for its toughness. Masters Men: Tuatara, a living dinosaur. 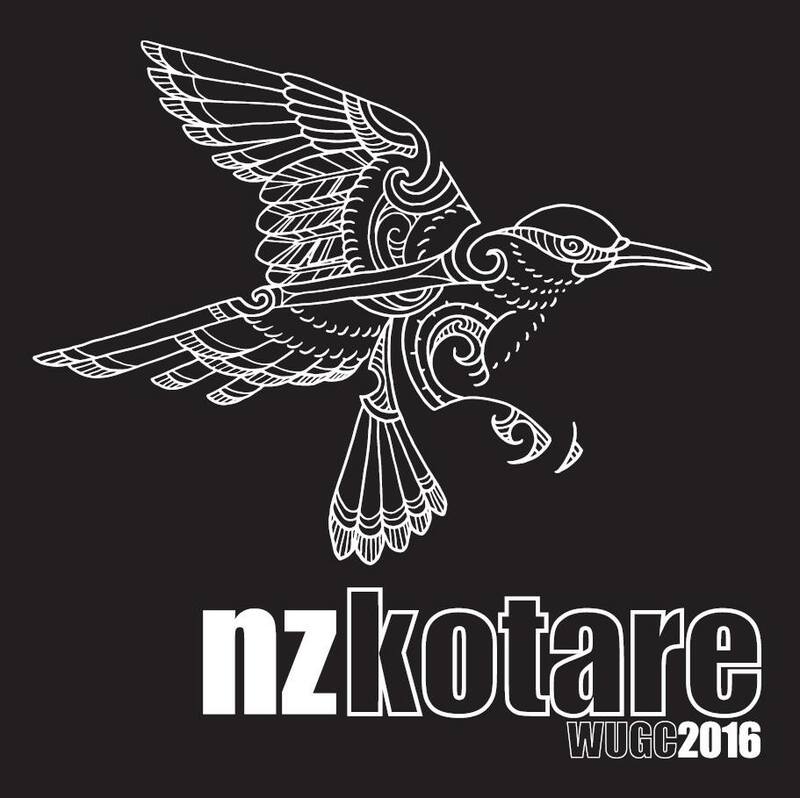 Masters Women: Kotare, scared kingfisher with control over the waves. 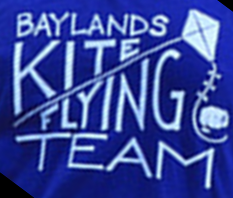 The Baylands Kite Flying Team is representing the United States at the 2016 World Ultimate (and Guts) Championships in the Masters Women's Division. BKFT earned this honor by winning the 2015 USA Ultimate Masters Women's Championship. In a division with 10 other teams, the USA Masters Women's team is seeded #1 at 2016 Worlds. USA won the inaugural Masters Women's WUGC event in 2012. Team USA begins their run toward another World title on Sunday, June 19, at 10:30am EDT against France. The 2016 World Ultimate (and Guts) Championships Team is starting soon for the USA's five ultimate teams. U.S. teams are scheduled to play a combined total of 18 games in the first three days of the international ultimate tournament in London. Times have been adjusted to EDT. 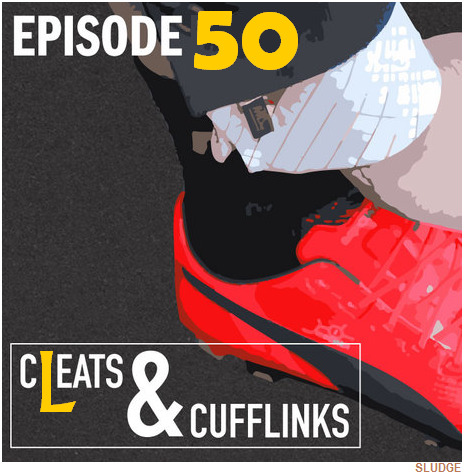 Congrats to Cleats & Cufflinks, Major League Ultimate's regular podcast, for reaching a milestone. Early in the 50th episode, MLU's Executive VP and podcast host Nic Darling reflected on the accomplishment with: "This show has come and gone, had its ups and downs, its changes in personnel." Much later, Nic takes a wider angle on how much the sport of ultimate has grown and has been embraced. Darling says: "We are starting to gain acceptance....as a sport. And, this is not just our work. The AUDL gets credit for this. USA U[ltimate] gets credit for this. All the players out there working....The sport is gaining...leaps and bounds of respect." Team Canada's men's ultimate team have won 3 of the last 5 World Ultimate Championships. Team Canada has put together another strong squad for this year's WUGC in London. 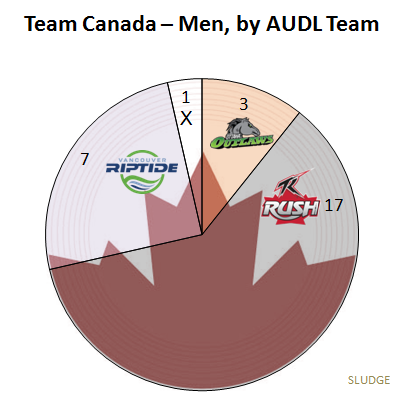 27 of the 28 selected players on Team Canada's men's WUGC team are on a 2016 AUDL roster. 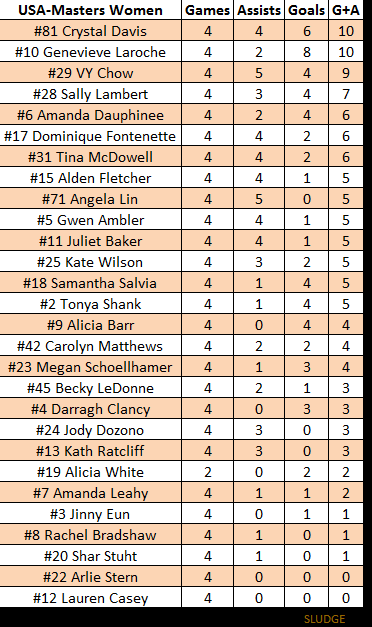 17 of the 28 (60.7%) players are currently rostered on the Toronto Rush. 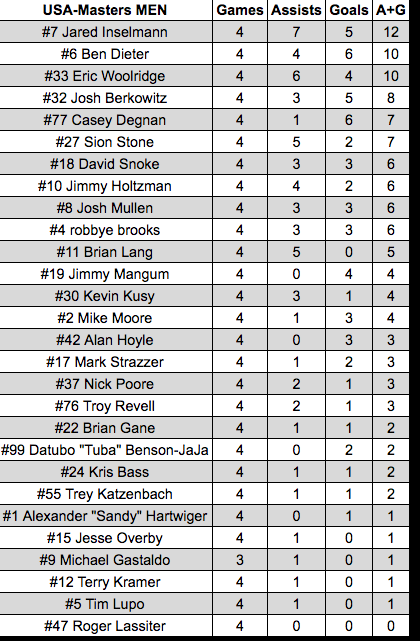 20 of the 27 Team Canada's AUDL players play in the AUDL East Division. 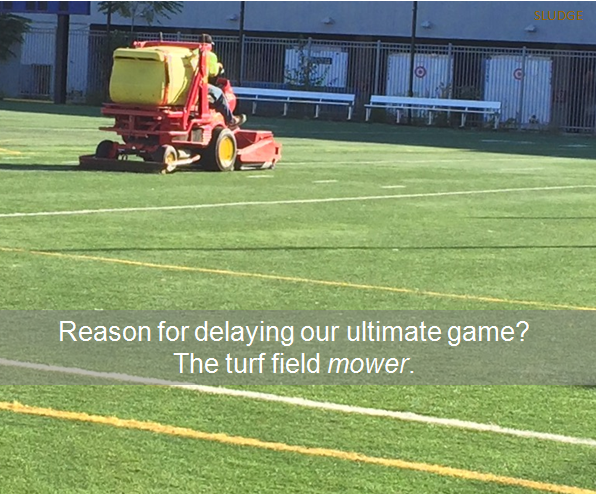 Toronto does not have any AUDL games scheduled for the next 2 weeks. Also, Scott Hastie is coach of Team Canada, as well as head coach of Toronto Rush. 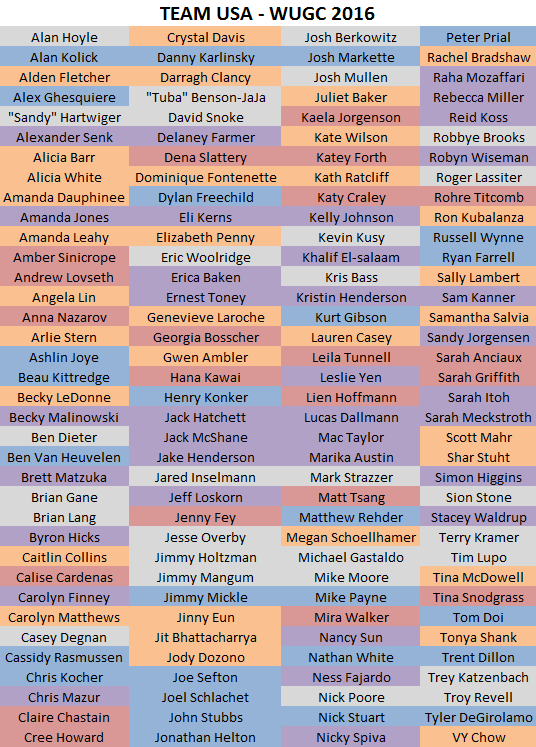 Washington D.C. Truck Stop released their 2016 club roster for the USA Ultimate Triple Crown Tour season. Truck Stop finished 7th place last season. WHAT: Quadrennial international ultimate tournament organized by World Flying Disc Federation (WFDF). Participating ultimate teams represent their country in the competition division(s) of men, mixed, women, masters men, &/or masters women. World Ultimate and Guts Championships ("Worlds") differs from World Ultimate Club Championships in that each country may enter only one team per division at WUGC. Just like the World Cup and kind of like the Olympics but dedicated for just one sport - ultimate. A disc event called "Guts" is also played during WUGC. 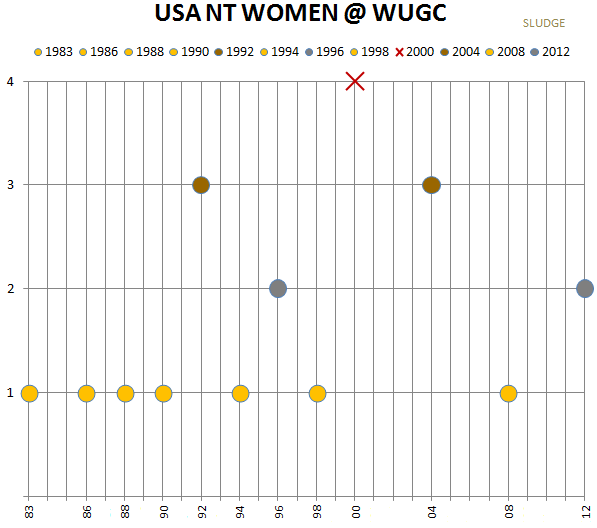 HISTORY: WUGC has completed 13 tournaments, starting in 1983. 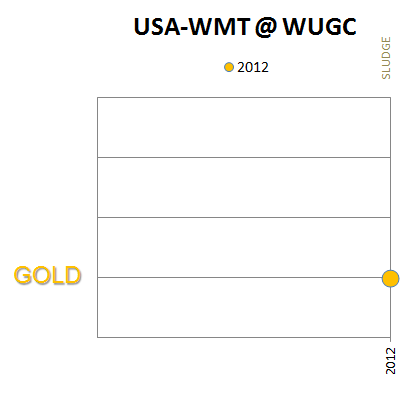 Only five different countries have ever won a WUGC gold medal. WHERE: UCL Sports Ground, London Colney, U.K.
WHO: Athletes make up over 120 teams from 41 countries. SCHEDULE: Sunday through Saturday's schedule of all WUC games. WATCH: Seven days worth of select games will be livestreamed for free by WFDF. The D.C. Breeze won 27-26 (11-10 half) in dramatic fashion over the New York Empire last night. With 5:20 left in the 3rd quarter, the Breeze had what felt like an insurmountable 5-goal lead. With less than 2 minutes left, D.C. had a 2-goal lead in the 4th quarter. With a 1-goal lead and 20 seconds in the game, Markham Shofner hucked a deep shot to the endzone which fell incomplete. New York seized the opportunity. With 10 seconds remaining, New York fbegan their their last offensive drive and completed a 40-yard hammer from Ryan Drost to Jeff Babbitt for the equalizer - tied at 24s. Again, the Empire returned with a last second score to tie in overtime. It was a wild finish. In the 2nd (sudden death) overtime, New York - who received the pull - scored what was thought to be the final score of the game. The home crowd fell silent. The Empire coach and players stormed the field for a brief second until everyone realized the a pick was called which negated the score and push them back 10 yards. A few throws later, New York threw away their chance to score and win the game. Breeze took advantage of the Empire's turnover in 2OT with a Kolick hanging lefty backhand toward the endzone which Matt Kerrigan caught after a boxing out the defender. Kolick admitted later in a post-game interview with Bryan Jones that his game-winning toss was a "garbage" throw. 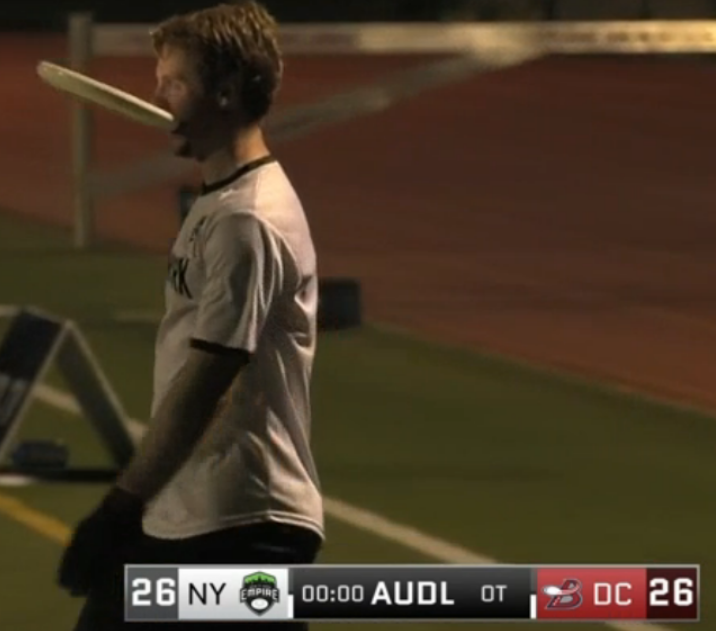 It wasn't a pretty win, but it was a still a 27-26 win over New York Empire, giving DC its 8th win of the 2016 AUDL season. 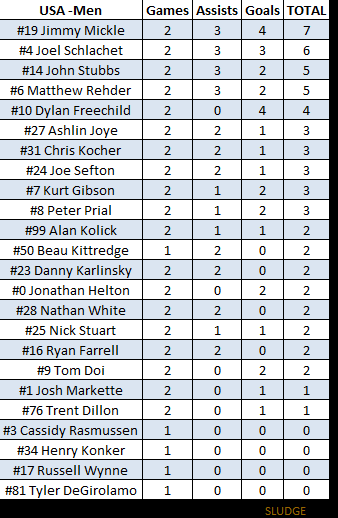 Jeff Wodatch led the Breeze team with caught 5 goals, while Alan Kolick threw a team-high 5 assists. Matthew "Rowan" McDonnell had 5 defensive blocks. It was a hot humid day in the nation's capital which led to a few players taking an injury due to cramping. Two Breeze players, Tom Doi and Nicky Spiva, played limited due to injuries sustained during the game. The Breeze were without Coaches Ghesquiere (head) and Itoh (assistant), plus some regular players due to travel for the upcoming World Ultimate and Guts Championships in London.